If you’d like to try a team building workshop that has a double mission of building team skills and helping those with mobility challenges, our Freedom Wheels Charity Wheelchair Team Building Workshop might be just the ticket. With a three-part mission, this workshop offers a multitude of benefits for you, your team, your company, and the community. It’s the sad truth that many of the Americans who need mobility devices such as wheelchairs can’t even afford them. In every community, there’s someone who could use help with affording these expensive yet necessary items. Freedom Wheels Charity aims to relieve some of that financial stress by having teams assemble and donate wheelchairs for those who need them. Local veterans’ centres, hospitals or even a national wheelchair organization can all benefit from our Freedom Wheels Charity workshop. We can even invite to the workshop representatives from whichever group ultimately receives your wheelchairs. It’s often a memorable ending to a great day of team building exercises and activities. You can even let us know if your company has a partner, you’d like us to work with- we’ll set things up with them, too. Either way, your company can rest easy, knowing their training dollars went towards not only improving their employees’ workplace skills, but also towards fulfilling their mission of corporate social responsibility. 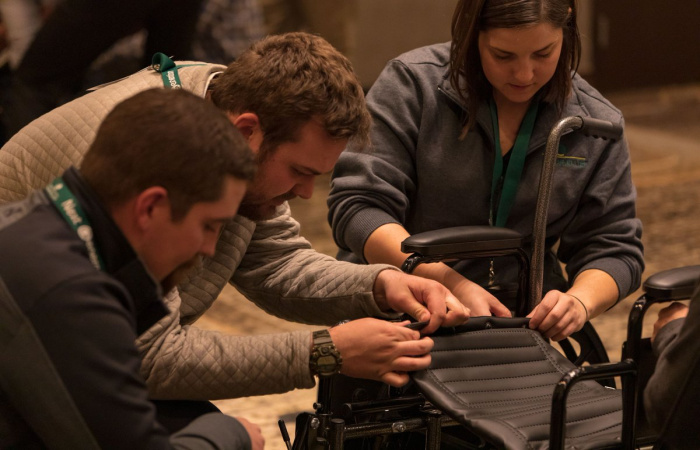 It’s not easy building wheelchairs, especially when teams are given challenges every step of the way! Our facilitators really know how to get things going with a nice set of obstacles and problem-solving activities for the Freedom Wheels Charity Team Building Workshop. It wouldn’t be any fun if there weren’t a few challenges thrown in there! It’s a given that teams will be challenged to communicate, collaborate, and think creatively in order to go from Point A to Point B in this workshop. Whether you choose a wheelchair obstacle course, a race or a wheelchair-decorating session as the final activity, we know your team will come away with an enhanced set of skills that will translate back to the office. They’ll come away with a fresh perspective on team work, the value of their individual contributions, and how to communicate more effectively in the workplace. Pretty good for one little workshop! Call us today or fill out the quote form- we’ll explain how Freedom Wheels Charity can be customized for your group and your goals.